It’s very easy to set up the outgoing (SMTP) mail server of Gmail and use it on your desktop client (Thunderbird, Apple Mail, Outlook…) to send and deliver emails. It must be underlined, though, that Gmail’s outgoing mail server puts some strict mailing limits in order to deter spammers from using it. In detail, you will be able to handle up to 100 recipients a time and 500 messages per day: if you cross this restriction, Google may block your account. So if you need to send a multiple or bulk email – a newsletter, for instance – you should get a professional SMTP server like turboSMTP (which also comes with a free plan). 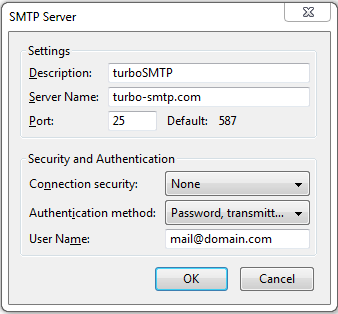 Then you can choose your security and authentication options, as explained in our article about SMTP configuration. And that’s it, you’re ready to send.